Although the South Fork American flows through the tiny gold rush era towns of Coloma and Lotus, there is enough of a tourist industry to support a wide range of places to stay. Car camping options are plentiful so bring your heaviest tent. Nearby Placerville and Auburn are also options. The South Fork American is also just about 45 min from Sacramento. Camp Lotus: One of the area’s oldest campgrounds–still family-owned and operated with lots of personality. This is no wilderness getaway, but the grounds are pretty, green, and welcoming. Some sites are more isolated than others so you might not be cheek-by-jowl with your neighbors. Hot showers, camp store, river access. Private boaters can use Camp Lotus as a put-in/take out spot and the popular kayaking play spot at Barking Dog rapid is just downstream. 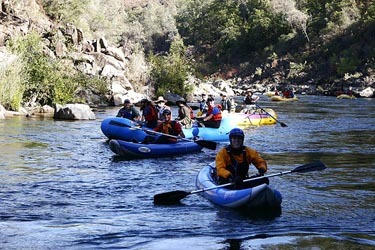 People rafting with a commercial outfitter are minutes away from their meet-spot. (530) 622-8672. Camping near the South Fork is usually quite plush. Camp Lotus has running water, hot showers, grassy lawns, riverside campsites, and volleyball nets. Grab some marshmallows, graham crackers, and Hershey’s bars and enjoy the most comfortable camping imaginable! Cabins at Camp Lotus: Lotus, (530) 622-8672. In addition to camp sites, Camp Lotus offers swankier lodging in their private American River Cabins and Yuba River Cabin. The Yuba River Cabin features a full kitchen, wood burning stove, and private yard. The smaller American River Cabins are perfect for couples. Sierra Nevada House: Coloma, (530) 626-8096. This historic complex has six newly rooms. Each have a private bath and access to the outdoor veranda with views of the Coloma-Lotus river valley. The Sierra Nevada House also has a restaurant and bar downstairs for lunch or dinner. Sometimes during the summer there are special events like Salsa dancing lessons mid-week. Coloma Country Inn Bed & Breakfast: Coloma, (530) 622-6919. The Coloma Country Inn is located smack-dab in the middle of the Gold Discovery State Hisotric Park in Coloma–the literal heart of the California Gold Rush. This is a great place to stay if you want a little plushness and luxury after a day on the river. Albert Shafsky House Bed & Breakfast: Placerville, (530) 642-2776. Placerville’s Historic District is about 20 minutes from the South Fork and home to the 1902 Albert Shafsky House. The three swanky guest rooms are each a world away from wet neoprene, gritty sandals, and the smell of sunscreen. Tasty breakfast is included. The Historic Cary House Hotel: Placerville, (530) 622-4271. If doilies and B&B’s aren’t really your thing but you still want a bed and a nice pillow, check out The Cary House on Placerville’s historic Main Street. Guest rooms and suites all feature private baths, TV, telephone, and heating and air conditioning. No two rooms are the same at the Cary House and it is the perfect venue for your stay in the gold country. Best Western Placerville Inn: Placerville, (800) 854-9100. Courtyard by Marriott in Folsom: Folsom, 916-984-7624.